Twenty-four LoCo Ale Trail breweries will be at the LoCo Brewfest pouring delicious brews for your drinking pleasure. These breweries range from farm breweries to urban tasting rooms, newly opened to seasoned favorites and everything in between. Guests will also get to taste beers from Bear Chase Brewing Company- a brewery in Loudoun that isn’t open to the public yet! Other great breweries in attendance include Adroit Theory Brewing, B Chord Brewing Company, Crooked Run Brewing, Lost Rhino Brewing Company, Old Ox Brewery, Vanish and more. 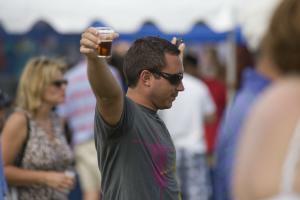 The LoCo Brewfest will be home to more than 40 beers! Each brewery will be pouring two brews with one of those being a session beer. By attending this festival, you will be the first to sample some of the newest beers on the LoCo Ale Trail! Loudoun Station offers an eclectic mix of restaurants all nestled among the future home of the Silver Line extension. Many of Loudoun Station&apos;s restaurants will be serving delicious food at the LoCo Brewfest. Grab bites from Blackfinn Ameripub or take a stroll through the Loudoun Station Farmer’s Market for some fresh produce! DJ John Paul with Megawatt will be entertaining guests all afternoon. Enjoy some of the latest hits while sampling your preferred brews. And, if that’s not enough entertainment, exotic cars from Loudoun County Exotics will be on display for your viewing pleasure. Be sure to snap a photo for your social accounts! Don&apos;t wait! Get your tickets now. All tickets will include entry to the festival, a commemorative tasting glass and unlimited tastings. 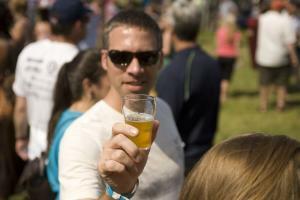 If you&apos;re looking for an exclusive experience, get a VIP ticket, which will grant you entry to the festival one hour early, access to the VIP tent and access to eight exclusive beers not available to the general admission crowd. Let&apos;s not forget about those special Designated Drivers or non-drinkers. Their discounted ticket gets them all the root beer they can imagine! Kids are welcome and ages 10 and under are free. We can&apos;t wait to see you on Saturday, June 2nd at Loudoun Station to celebrate all of the wonderful breweries and delicious beers available on the LoCo Ale Trail!